The clinical and therapeutic experience, alongside with the research findings, which are presented in the book, demonstrate some advantages and scientific evidences of the art psychotherapy programs that the authors have used and developed throughout the last fifteen years. They strived to integrate their approaches with the art psychotherapy practice into the system of mainstream medical care applied at hospitals that embrace both biological treatments and some more traditional therapies (occupational therapy, individual counseling, cognitive-behavioral therapy, etc. ), as well as complimentary therapies such as art therapy and mindfulness development programs. The present book is truly one of the first publications on this topic, filling a major gap in the art therapy literature concerning the vibrant field of working with military members. It embraces both a high standard academic evidence base for art therapy and a variety of innovative empirical interventions applied with this clinical group, that have never been presented in publications. 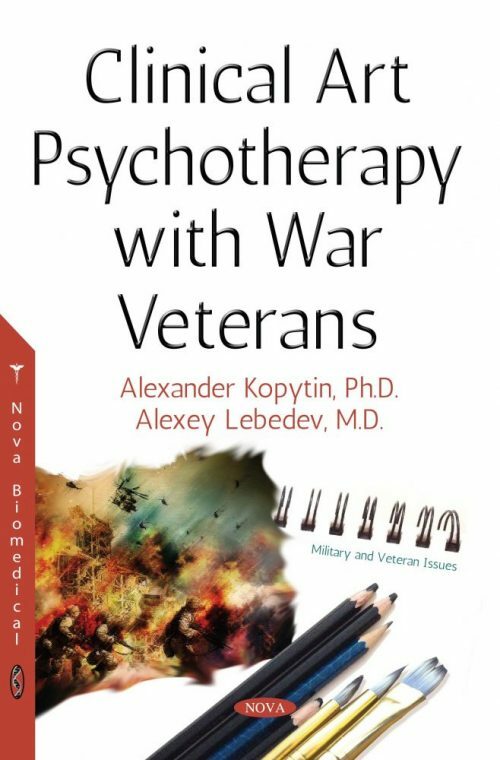 A particular value of the book is the presentation of how phototherapy techniques, environmental and nature-based practices, and those supporting emotional intelligence and coping-skills in ex-servicemen have been implemented with veterans. A’Court, B. (2017). The art of mindful walking in earth-based art therapy. In A. Kopytin and M. Rugh (Eds. ), Environmental Expressive Therapies: Nature-assisted Theory and Practice (pp. 123-160). New York, NY: Routledge/Taylor and Francis. Allport, G.W. (1961). Pattern and Growth in Personality. New York, NY: Holt, Reinhart and Winston. Apchel, V. Y., & Tsygan V. N. (1999). Stress and coping with stress]. St.-Petersburg: Peter. Apter, M.J. (1985). Humor and Laughter: An Anthropological Approach. Ithaca, NY: Cornell University Press. Apter, M.J. (1991). A structural phenomenology of play. In J.H. Kerr & M.J. Apter (Eds. ), Adult Play: A reversal theory approach (pp.13–29). Amsterdam: Swets & Zeitlinger. Backos, A., and Mazzeo, C. (2017). Group therapy and PTSD: Acceptance and commitment. Art therapy groups with Vietnam veterans with PTSD. In P. Howie (Ed. ), Art Therapy with Military Populations: History, Innovation, and Applications (pp.165-176). New York, NY: Routledge/Taylor and Francis. Batt-Rawdon, K.B., and Tellnes, G. (2005). Nature culture health activities as a method of rehabilitation: An evaluation of participants’ health, quality of life and function. International Journal of Rehabilitation Research, 28(2), 175-180. Bengesser, G. The lacking sense of humor in some psychopaths. In G. Roux, and M. Laharie (Eds. ), the Humor. History, Culture and Psychology (pp.245-247). Paris: SIPE. Berger, R. (2008). Building a home in nature. Journal of Humanistic Psychology, 48(2), 264–279. Berger, R. (2009a). Nature Therapy – Developing a Framework for Practice. A Ph.D. School of Health and Social Sciences. University of Abertay, Dundee. Berger, R. (2009b). Being in nature – Nature Therapy with older adults. Journal of Holistic Nursing, 27(1), 45-51. Berger, R. and Lahad, M. (2013). The Healing Forest in Post-Crisis Work with Children. London: Jessica Kingsley Publishers. Berger, R. and McLeod, J. (2006) Incorporating nature into therapy: A framework for practice. The Journal of Systemic Therapies, 25(2), 80-94. Bespalko, I.G. (2004). The scale for psychological express-measurement of unstructured depressive disorders. St.-Petersburg: St.-Petersburg Scientific-Research Psychoneurological Institute in the Name of V.M. Bekhterev. Bion, W.R. (1962). Learning from Experience. London: Karnac. Bruner, J. S., Oliver, R. R., Greenfield, P. M., Hornsby, J. R. et al. (1966). Studies in Cognitive Growth. New York: Wiley. Burkovskij, G.V., Kotsubinskij, A.P., Levchenko, E.V., & Lomachenkov, A.S. (1998). The use of the Questionnaire of Quality of Life (World Health Organization) in Psychiatric Practice. St.-Petersburg: St.-Petersburg Scientific-Research Psychoneurological Institute in the Name of V.M. Bekhterev. Burls, A. (2007b). People and green spaces: Promoting public health and mental well-being through eco-therapy. Journal of Public Mental Health, 6(3), 24-39. Calvin, W. H. (1986). How Brains Think: Evolving Intelligence, Then and Now. New York: Basic Books. Clay, R.A. (1997). Researchers harness the power of humor. APA Monitor, 28(9), 1-8. Cohen, B., Barnes, M.M., Rankin, A. (1995). Managing Traumatic Stress Through Art. Drawing from the Center. Baltimore: The Sidran Press. DeLucia, J.(2017). How the studio and gallery experience benefits military members and their families. In P. Howie (Ed. ), Art Therapy with Military Populations: History, Innovation, and Applications (pp.30-40). New York, NY: Routledge/Taylor & Francis. Derogatis, L.R. (1983). The Symptomatic Checklist (SCL-90-R) administration, scoring and procedures manual-II. Towson, MD: Clinical Psychometric Research. Doskin, V.A., Lavrenteva, N.A., Miroshnikov, M.P., & Sharay, V.B. (1973). Test for differential self-measuring of the functional state. Voprosy Psihologii, 6, 141-145. De Vries, J. and Van Heck, G.L. (1997). The World Health Organization Quality of Life Assessment Instrument (WHOQOL-100): Validation Study with the Dutch Version. European Journal of Psychological Assessment, 13(3), 164-178. De Young, R. (2010). Restoring mental vitality in an endangered world. Ecopsychology, 2, 13-22. De Young, R. (2013). Environmental psychology overview. In S. R. Klein and A. H. Huffman (Eds. ), Green Organizations: Driving Change with IO Psychology (pp. 17-33). New York: Routledge. Faber-Taylor, A., and Kuo, F.E. (2009). Children with attention deficit concentrate better after walk in the park. Journal of Attention Disorders, 12(5), 402-409. Fleming L.L. (2015). Veteran to farmer programs: An emerging nature-based programming trend. Journal of Therapeutic Horticulture: American Horticultural Therapy Association, 25(1), 27-49. Foa, E., Kean, T., Fridman, M., and Cohen, J. (Eds.) (2010). Effective Treatment for PTSD. New York, NY: Guilford Press. Frankl, V.E. (1984). Man’s Search for Meaning. New York: Washington Square Press. Freud, S. (1928). Humour. International Journal of Psychoanalysis, 9, 1–6. Gelkopf, M., & Kreitler, S. (1996). Is humor only fun, an alternative cure or magic: The cognitive therapeutic potential of humor. Journal of Cognitive Psychotherapy, 10, 235-254. Gervais, M., & Wilson, D.S. (2005). The evolution and functions of laughter and humor: A synthetic approach. Quarterly Review of Biology, 80, 395-430. Golub, D. (1984) Symbolic expression in post-traumatic stress disorder: Vietnam combat veterans in art therapy. The Arts in Psychotherapy, 12, 285-296. Gregory, L.A, Fried, Y., and Slowik, L.H. (2013). “My space”: A moderated mediation model of the effect of architectural and experienced privacy and workspace personalization on emotional exhaustion at work. Journal of Environmental Psychology. 36, 144-152. Groeneweggen, P., van den Berg, A., de Vries, S., and Verheij, R. (2006). Vitamin C: Effects of green space on health, wellbeing and social safety. BMC Public Health, 6, 149-159. Haeseler, M. P. (1998). Crossing the border: Cultural implications of entering a new art therapy workplace. In A. R. Hiscox, & A. C. Calisch (Eds. ), Tapestry of Cultural Issues in Art Therapy (pp. 327-346). London, England: Jessica Kingsley. Harrison, T., & Clarke, D. (1992). The Northeld experiments. British Journal of Psychiatry, 160, 698-708. Hass-Cohen, N., and West, K. (2008). Art therapy, neuroscience and complex PTSD. In N. Hass-Cohen and R. Carr (Eds.) Art Therapy and Clinical Neuroscience (pp.223-252). London and Philadelphia: Jessica Kingsley Publishers. Heerwagen, J. (2009). Biophilia, health and wellbeing. In L. Campbell and A. Wiesen (Eds. ), Restorative Commons: Creating Health and Well-being through Urban Landscapes (pp.39-57). Pennsylvania: USDA Forest Service. Heimets, M. (1994).The phenomenon of personalization of the environment. Journal of Russian & East European Psychology, 32(3), 24-32. Horowitz, M. J. (1983). Image Formation and Psychotherapy. New York, NY: Jason Aronson. Howie, P. (Ed.) (2017a). Art Therapy with Military Populations: History, Innovation, and Applications. New York, NY: Routledge/Taylor and Francis. Howie, P. (2017b). Psychosis, attachment, and trauma. In P. Howie (Ed. ), Art Therapy with Military Populations: History, Innovation, and Applications (pp.30-40). New York, NY: Routledge/Taylor and Francis. Howie, P. (2017c). Family art therapy treatment at Walter Read. In P. Howie (Ed. ), Art Therapy with Military Populations: History, Innovation, and applications (pp.53-63). New York, NY: Routledge/Taylor and Francis. Howie, P. (2017d). Group art therapy: The evolution of treatment and the power of witness. In P. Howie (Ed. ), Art Therapy with Military Populations: History, Innovation, and Applications (pp.64-74). New York, NY: Routledge/Taylor and Francis. Jakab, I. (1998a). Humor and psychoanalysis. In G. Roux, & M Laharie (Eds. ), the Humor. History, Culture and Psychology (pp.15-22). Paris: SIPE. Jakab I. (1998b). Children’s humor. In G. Roux, M. Laharie (Eds. ), the Humor. History, Culture and Psychology (pp.77-82). Paris: SIPE. Kalmanowitz, D. and Lloyd, B. (2002). Inhabiting the uninhabitable: The use of art-making with teachers in Southwest Kosovo. The Arts in Psychotherapy, 29(1), 41–52. Kalmanowitz, D. and Lloyd, B. (2005). Inside the portable studio: Art therapy in the former Yugoslavia 1994–2002. In D. Kalmanowitz & B. Lloyd (Eds. ), Art Therapy and Political Violence: With Art without Illusion (pp. 106–125). New York, NY: Routledge. Kalmanowitz, D. and Lloyd, B. (2011). Inside-out outside-in: Found objects and Portable Studio. In E.G. Levine and S.K. Levine (Eds. ), Art in Action. Expressive Arts Therapy and Social Change (pp.104-127). London and Philadelphia: Jessica Kingsley. Kaplan, S. (1995a). The restorative benefits of nature: Toward an integrative framework. Journal of Environmental Psychology, 15,169–182. Kaplan, S. (1995b). The urban forest as a source of psychological well-being. In G. A. Bradley (Ed. ), Urban Forest Landscapes: Integrating Multidisciplinary Perspectives (pp. 100–110). Seattle: University of Washington Press. Kaplan, S. and Kaplan, R. (2009). Creating a larger role for environmental psychology: The Reasonable person model as an integrative framework. Journal of Environmental Psychology, 29, 329-339. Kellert, S.R. and Derr, V. (1998). A national study of outdoor wilderness experience. Yale: School of Forestry and Environmental Studies, Yale University. Kellert, S.R., Wilson, E.O. (Eds.) (1993). The Biophilia Hypothesis. Washington, DC: Island Press. Killinger, B. (1987). Humor in psychotherapy: A shift to a new perspective. In V.F. Fry & W.A. Salameh (Eds. ), Handbook of Humor and Psychotherapy: Advances in the Clinical Use of Humor (pp.21-40). Sarasota, FL: Professional Resource Exchange. Kolk, B. van der (Ed.) (1987). Psychological Trauma. Washington, DC: American Psychiatric Press. Kolov, S. A., Ostapenko, A. V., & Krivtsov A. G. (2005). Psuhologicheskoje issledovanije posttravmaticheskogo stressovogo rasstrojstva [Psychological study of the Post-Traumatic Stress Disorder]. Vestnik Psychotherapii, 13, 23-35. Kopytin A. (2010). Systemic art therapy. Theoretical foundations, methodology of application, therapeutic, rehabilitation and de-stigmatizing effects. Doctorate Dissertation. St.-Petersburg: St.-Petersburg Scientific-Research Psychoneurological Institute in the Name of V.M. Bekhterev. Kopytin A. (2015). Sovremennaja klinicheskaya art terapija [Modern clinical art therapy]. Moscow: Kogito-Centre. Kopytin A., Rugh M. (Eds.) (2016). Green Studio: Nature and the Arts in Therapy. New York: Nova Science Publishers. Kopytin A., Rugh M. (Eds.) (2017). Environmental Expressive Therapies: Nature-Assisted Theory and Practice. New York, NY: Routledge/Taylor & Francis Group. Kubie, L.S. (1970). The destructive potential of humor in psychotherapy. American Journal of Psychiatry, 127, 861-866. Kuhlman, T.L. (1984). Humor and Psychotherapy. Homewood, IL: Dow Jones-Irwin Dorsey Professional Books. Lefcourt, H.M. (2001). Humor: The Psychology of Living Buoyantly. New York: Kluwer Academic. Lefcourt, H.M., Martin, R.A. (1986). Humor and Life Stress: Antidote to Adversity. New York: Springer-Verlag. Levine, S.K. (2011). Art opens to the world: Expressive arts and social action. In E.G. Levine and S.K. Levine (Eds. ), Art in Action. Expressive Arts Therapy and Social Change (pp.21-30). London and Philadelphia: Jessica Kingsley. Linden, S. & Grut, J. (2002). The Healing Fields; Working with Psychotherapy and Nature to Rebuild Shattered Lives. Published in Association with the Medical Foundation for the Care of Victims of Torture. London: Frances Lincoln. Lobban, J. (2014). The invisible wound: Veterans’ art therapy. International Journal of Art Therapy: Inscape, 19(1), 3-18. Malchiodi, C. A. (2007). The Art Therapy Sourcebook (2nd ed. ).New York, NY: McGraw-Hill. Markow-Speiser V. and Schwartz S. (2011). These stories are burning a hole in my brain: Using the arts to tell the stories of the Ethiopian Jewish Immigrant Community in Israel. In E. Levine and S. Levine (Eds.) Art in Action: Expressive Arts Therapy and Social Change (pp.128-144).London and Philadelphia: Jessica Kingsley Publishers. Martin, R.A. (1989). Humor and the mastery of living: Using humor to cope with the daily stresses of growing up. In P.E. McGhee (Ed. ), Humor and Children’s Development: A Guide to Practical Applications (pp. 135–154). New York: Haworth Press. Martin, R.A. (2009). Psihologiya yumora [Psychology of humor]. St.-Petersburg: Piter [Original publication: Martin, R.A. (1007). Psychology of humor: An integrative approach. Burlington, MA: Elsevier]. Martin, R.A., Puhlik-Doris, P., Larsen, G., Gray, J., Weir, K. (2003). Individual differences in uses of humor and their relation to psychological well-being: Development of the Humor Styles Questionnaire. Journal of Research in Personality, 37(1), 48–75. McKee, E.A. (2017). Art therapy with substance abuse and co-occurring disorders in military populations. In P. Howie (Ed. ), Art Therapy with Military Populations: History, Innovation, and Applications (pp.134-146). New York, NY: Routledge/Taylor and Francis. McNeilly, G. (1990). Further contributions to group analytic art therapy. Inscape: Journal of Art Therapy, summer, 8-11. McNeilly, G. (2006). Group Analytic Art Therapy. London: Jessica Kingsley Publishers. Nagy,J. (1998) Anxiety, depression and humor. In G. Roux, & M Laharie (Eds. ), the Humor. History, Culture and Psychology (pp. 255-257). Paris: SIPE. Nanda, U.H., Gaydos, L.B., Hathorn, K., & Watkins, N. (2010). Art and posttraumatic stress: A review of the empirical literature on the therapeutic implications of artwork for war veterans with posttraumatic stress disorder. Environment and Behavior, 42, 376-390. Nebbe, L. (2006). Nature Therapy. Handbook of Animal-Assisted Therapy. San Diego, CA: Academic Press. Nowell Hall, P. (1987). Art therapy: A way of healing the split, In T. Dalley, C. Case, D. Halliday, J. Schaverien, P. Nowell Hall, F. Weir, and D. Waller (Eds. ), Images of Art Therapy (pp.157-186). London: Routledge. O’Brien, E. (2005). Publics and woodlands in England: Wellbeing, local identity, social learning, conflict and management. Forestry, 78(4), 321-335. Peterson, J.P., & Polio, H.R. (1982). Therapeutic effectiveness of differentially targeted humorous remarks in group psychotherapy. Group, 6(4), 39-50. Piaget, J., & Inhelder, B. (1967). The Child’s Conception of Space. New York, NY: Norton. Pierce, R.A. (1994). Use and abuse of laughter in psychotherapy. In H.S. Strean (Ed. ), the Use of Humor in Psychotherapy (pp. 105–111). Northvale, NJ: Jason Aronson. Pillay, Y. (2009). The use of digital narratives to enhance counseling and psychotherapy. Journal of Creativity in Mental Health, 4, 32–41. Prochaska, J.O., and DiClemente, C.C. (1984). The Transtheoretical Approach: Crossing the Traditional Boundaries of Therapy. Melbourne, Florida: Krieger Publishing Company. Prochaska, J. O. & Norcross, J. (2014). Systems of Psychotherapy: A Transtheoretical Analysis (Eight Edition). Cengage Learning, CT. Belmont, CA: Brooks Cole. Provine, R.R., Fischer K.R. (1989). Laughing, smiling, and talking: Relation to sleeping and social context in humans. Ethology, 83(4), 295–305. Reynolds, M.W., Nabors, L., and Quinlan, A. (2000). The effectiveness of art therapy: Does it work? Art Therapy: Journal of the American Art Therapy Association, 17(3), 207-213. Rhyne, J. (1995). The Gestalt Art Experience. Chicago: Magnolia Street Publishers. Riley, S. (2001). Group Process Made Visible. New York: Brunner-Routledge. Roux, G., & Laharie, M. (Eds.) (1998). The Humor. History, Culture and Psychology. Paris: SIPE. Rosenheim, E., Golan, G. (1986). Patient’s reactions to humorous interventions in psychotherapy. American Journal of Psychotherapy, 40(1), 110–124. Rubin, J. (2005). Child Art Therapy. Hoboken, NJ: John Wiley & Sons. Shapiro, J. (2005). Destruction as raw material for creation. In Adolescents and Self-Injury: Symposium Papers. Jerusalem, Israel: Summit Institute: Association for Treatment Services, Psychosocial Rehabilitation, and Welfare. (In Hebrew). Silver, R. (2002). Three Art Assessments. New York: Brunner-Routledge. Silver, R. (2007). The Silver Drawing Test and Draw-a-Story. New York: Routledge. Silver, R. (2010). Identifying Risks for Aggression and Depression through Metaphors. The Mouse, the Bride and the Use of Humor. Dewitt, NY: Purple Finch Press. Simson, S., and Straus, M. (1998). Horticulture as Therapy: Principles and Practice. Binghampton, NY: The Hawthorne Press. Skaife, S. (1990). Self-determination in group analytic art therapy. Group Analysis, 23(3), 237-244. Skaife, S., and Huet, V. (1998). Art Psychotherapy Groups: Between Pictures and Words. New York: Routledge. Slayton, S.C., D’Archer, J., & Kaplan, F. (2010). Outcome studies on the efficacy of art therapy: A review of findings. Art Therapy: Journal of the American Art Therapy Association, 27(3), 108-118. Smith, A. (2016). A literature review of the therapeutic mechanisms of art therapy for veterans with post-traumatic stress disorder. International Journal of Art Therapy: Formerly Inscape, 21(2), 66-74. Solso, R. L. (1994). Cognition and the Visual Arts. Cambridge, MA: Massachusetts Institute of Technology Press. Tolstoy, L. (2006). Hadji Murad. New York, NY: Cosimo Classics. Vaillant, G.E. (2000). Adaptive mental mechanisms: Their role in a positive psychology. American Psychologist, 55(1), 89–98. Waller, D. (1993). Group Interactive Art Therapy. Its Use in Training and Treatment. London and New York: Routledge.Webster’s New World Dictionary of the American Language. (1986). Second college edition. New York, NY: Prentice Hall Press/A division of Simon & Schuster. Weiser, J. (1999). Photo Therapy Techniques: Exploring the Secrets of Personal Snapshots and Family Albums. Vancouver: Photo Therapy Centre. Winn, L. (2008). Post-Traumatic Stress Disorder and Drama therapy (Treatment and Risk Reduction).London: Jessica Kingsley Publishers. World Health Organization. (1992). The ICD-10 Classification of Mental and Behavioral Disorders: Clinical Descriptions and Diagnostic Guidelines. Geneva, Switzerland: Author. The book is for mental health workers, particularly, creative and expressive arts therapists, psychotherapists, counselors and psychologists as well as artists and other creative workers wishing to explore and use therapeutic potential of art therapy and arts as an effective therapeutic tool applied either as a supplement to more conventional therapies and treatment interventions, or a specialized intervention of its own.